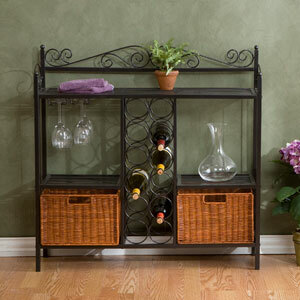 Elegant And Beautiful, This Bistro Wine Rack Will Help With Storage, Display And Organization All In One. Two Lower Hand Stained Rattan Baskets Function As Removable Drawers While Two Open Shelves And A Top Rack Are Extremely Versatile. Twelve Bottle Racks And A Set Of Glass Holders Makes This An Ideal Addition For Any Beginning Wine Connoisseur. Decorative Scrollwork Laces The Top For A Classic Touch. Textured Gun Metal Grey Finish. Strong Construction. Easy To Assemble.